Prime downtown location in a well cared for building. 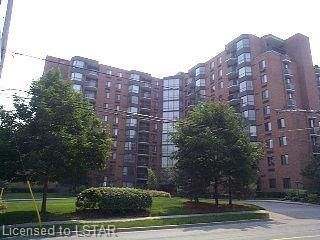 Desirable 2 bedroom end unit with 2 FULL BATHROOMS and in-suite laundry. Plenty of natural light with both sliding glass door to the balcony and large bay window in the living area. Large master bedroom with ensuite, including a jacuzzi tub. Assigned underground parking space and storage locker, plus free visitor parking in the huge lot off Albert Street. Enjoy the indoor saltwater pool with hot tub/sauna area with walkout to a large deck, exercise room, library, games room and the currently being built BBQ area. Walk to parks, trails, summer festivals, restaurants, Grand Theatre, Budweiser Gardens arena, the Market and more! Perfectly situated for the medical community, close to Schulich School of Medicine/LHSC, Victoria Hospital, UWO Hospital and St. Joe's Health Care. This building has undergone many updates including windows and EFIS multi-layer synthetic stucco.